I'm counting four strings. Judging by the size I would guess a tenor, or maybe baritone, ukulele. I think this was way before Baritone ukes. She was making recordings in early 1900's. It might have been something custom. I looks kind of like a tiple missing strings. If it had 5 it would be cuban. hmmm interestng photo. Perhaps it's some kind of small tenor guitar? It seems like her right hand is in the claw-hammer position too so that's my guess. 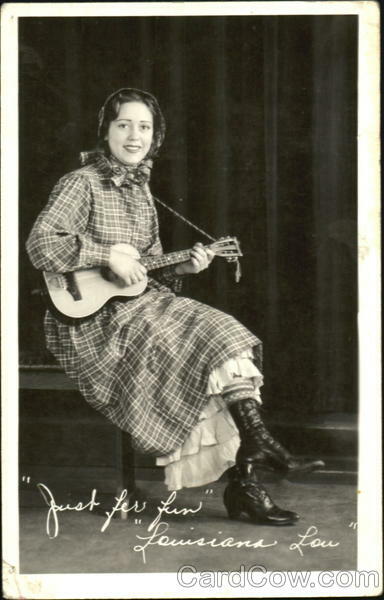 One thing people may not know is that there were many small four stringed instruments that pre and post-date the Ukulele. My 2 cents would also be that it is a Cavaquinho. I know of People who re-string them and tune 'em like Ukes. In fact, the Cavaquinho and the Braguinha ( one of the instruments that "became" the Ukulele along with the Rajao ) are very similar.